Arnott and Vederoff Ancestors - "Susie" (Stevens) Arnott, making apple sauce in the basement of their home on Paseo Way in Denver, Colorado. Susie canned a great deal and had a full kitchen in the basement in order to keep the mess out of the kitchen upstairs. She made pickles, all kinds of jam, canned tomatoes, peaches, pears, plums and much more. 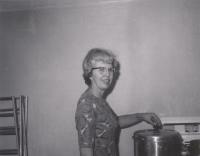 "Susie" (Stevens) Arnott, making apple sauce in the basement of their home on Paseo Way in Denver, Colorado. Susie canned a great deal and had a full kitchen in the basement in order to keep the mess out of the kitchen upstairs. She made pickles, all kinds of jam, canned tomatoes, peaches, pears, plums and much more.